STRUCTURAL SILICONE GLAZING – the best guarantee for long term rooflight integrity. Duplus frameless glass roof lights are created by combining high performance double glazed glass units with world class structural silicone glazing techniques – a solution which guarantees that the space beneath an installed Duplus rooflight is bathed in the maximum amount of natural light available. The panorama that can be observed through our pyramid and lantern roof lights is affected by little more than the edges of the double glazed units themselves. Our structural silicone glazed rooflight requires no internal hip or ridge framework to support the glass and there is no requirement for a clunky connecting support boss. Not only does our rooflight product look stunning – see our trust pilot reviews, but with less internal framework our product by comparison to a slim profiled lantern has significantly higher resistance to condensation. (See condensation technical notes for further information). Structural silicone glazing is a method utilising a silicone adhesive to attach glass to metal. Wind loads and other loads such as snow and impact loads, are transferred from the glass through the structural silicone adhesive to the perimeter frame of the rooflight and from there onto the structure of the building. It is absolutely imperative for the long term performance of any rooflight constructed in this manner, that the silicone bond maintains its adhesive and cohesive integrity, which will be tested to extremes by wind load and thermal stresses throughout its service life. Structural silicone glazing, as undertaken by Duplus, is a state-of-the-art application utilising only purpose designed high tensile structural silicones. Not all silicones are suitable to bond glass to metal. Weatherproofing silicones for example, should never be used as structural adhesives. They have low tensile strength, so when subjected to very high wind loads, specifically suction load, there is the potential for silicone joint failure and consequently loss of rooflight integrity. Our contemporary product range could only be achieved by utilising state-of-the-art structural silicone glazing techniques, standards of best practice in quality control, quality assurance, and structural bonding product application by our team of specialist silicone fabricators. All Duplus structurally glazed rooflights are manufactured under strictly controlled independently audited factory conditions. Structural joints are made in a clean, dry, dirt-free and frost-free environment which ensures the long term performance of the structural bond and in turn the integrity of our rooflight products. The structural silicone is manufactured by one of the world leaders in silicones – Dow Corning®. 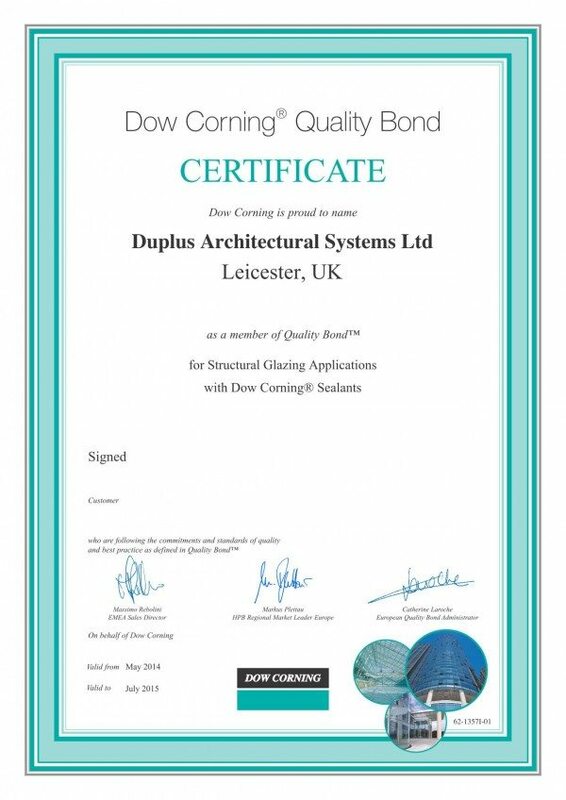 Duplus Architectural Systems are the only frameless glass rooflight manufacturer in the UK that is certified by Dow Corning® to their highest “Quality Bond™” standard. A full list of UK accredited members is available at //www.dowcorning.com/applications/qualitybond/applicatorsearchresults.aspx?popup=true&c=GBR&a=01. The structural silicone itself is Dow Corning’s 993 two part silicone rubber structural glazing sealant. This product meets the standard for structural glazing as developed by the EOTA working group and is CE marked as structural glazing sealant according to ETAG002, the European Technical Guidelines for structural glazing, it also meets the structural glazing sealant requirements according to EN13022. Dow Corning’s products are used extensively throughout our product range, from the Dow Corning® 3362 insulating glass sealant of the double glazed unit, to the 791 weatherproofing sealant used to form the perimeter water seal of the rooflight itself. All components used within our rooflight product range have been extensively tested by Dow Corning® to ensure complete compatibility with the structural bond in order to guarantee the longevity of our rooflight products. The importance of the structural bond should not be underestimated, in short, without it there can be no ‘frameless’ rooflight and with a weak or inferior bond this could lead to complete rooflight failure. So that we have complete certainty over our product quality, every rooflight has its structural silicone tested during the three day silicone bonding period. We undertake a minimum of five tests utilizing four different test methods. Only when your rooflight has passed all of these tests will it be ready for delivery. The physical samples of these tests are kept on file for the duration of the rooflight guarantee period by Duplus.